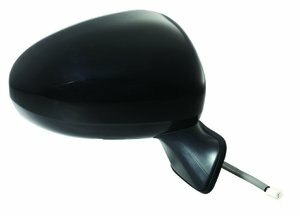 Passenger side mirror, tested to fit and function like the original, meets or exceeds OEM standards. Heated and power adjustable, OE-comparable wiring harness for hassle-free installation. Paint-To-Match, mirror comes in black but the cover is paintable to match color of the car. Wide-angle lens for maximum visibility with warning on the glass to meet FMVSS requirement.